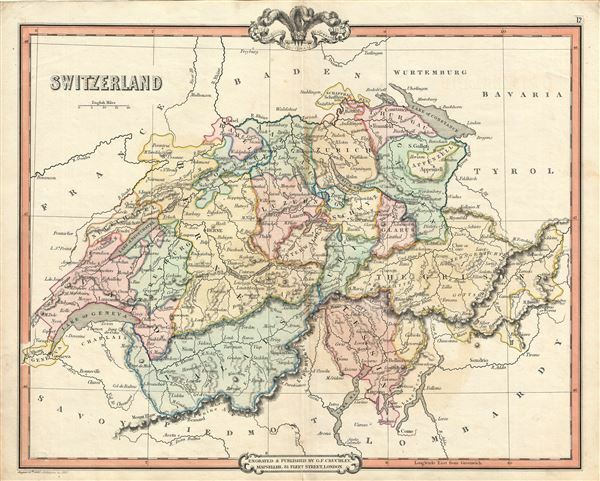 A lovely example of the 1850 George Frederick Cruchley map of Switzerland. It covers the entirety of Switzerland divided into its constituent Cantons from Vaud to the Grisons. After the ratification of a federal constitution in 1848, Switzerland underwent a rapid social and economic development. The cantonal currencies were replaced by a single currency (the Swiss Franc) and many of the cantons subsequently established representative governments and instituted freedom of the press and trade. Cruchley's General Atlas was unique for its period, employing a vivid color scheme extending even to the oceans, distinctive typography, and various uncommon decorative elements including a peacock feather crown and an imprint medallion, both of which break the printed border. Though many of the maps in this atlas are copyrighted in 1841, the atlas was first published in 1843 from the Cruchley office at 81 Fleet Street, London, and proving popular went through numerous reissues well into the 1850s. George Frederick Cruchley (April 23, 1797 - June 16, 1880) was a London based book and map seller active in the middle part of the 19th century. Cruchley began his cartographic career as an apprentice at the venerable Aaroon Arrowsmith firm. Many of Cruchley's earliest maps bear the words "From Arrowsmith's" on the imprint. In 1844 Cruchley acquired the massive stock of the important early 19th century firm of John Cary. Cruchley published his own maps as well as reissues of Cary's stock well into the 1870s. Cruchely is best known for his detailed plans of London, which in recent years have become increasingly scarce and desirable. Cruchley was based in London on 38 Ludgate Street until 1834 when he moved his offices to 81 Fleet Street. Shortly before his death in 1880 Cruchely auctioned (Hodgson's Auctions, Jan 16, 1877) his entire stock. Many of his map plates were thusly acquired by Gall and Inglis who continued the Cruchley tradition well into the early 20th century. Cruchley's son, also George Frederick (1837 - 1882), also continued to work as a book and map seller until his death. Cruchley, G. F., Selection of Maps from Cruchley's General Atlas, for the use of Schools and Private Tuition, London, 1850. Very good. Minor wear and some toning over original centerfold. Blank on verso.